As we are getting ready for Waterloo, visitors are invited to take the same road as Napoleon in Belgium. From Beaumont to Waterloo, through Charleroi, Fleurus and Ligny, several monuments bear witness to the Emperor’s presence in Wallonia, although they are not necessarily well-known by the general public. 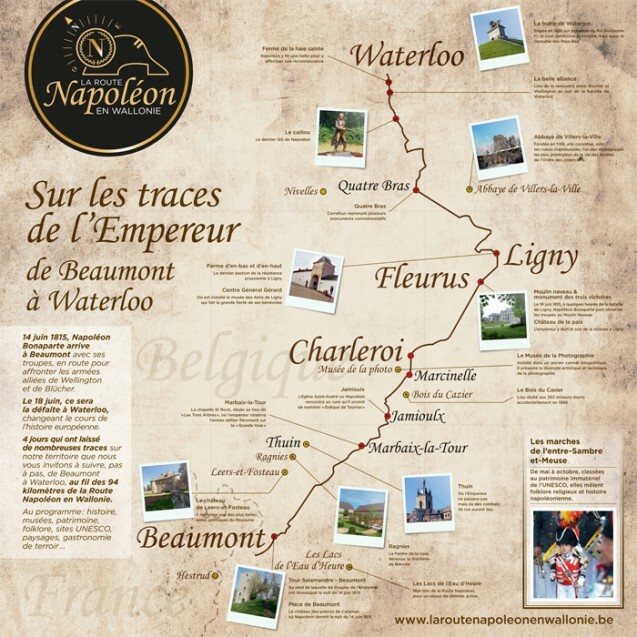 However, thanks to the Tourism Agency in Wallonia, the “route Napoléon” is now clearly indicated with signposts all along the way, as a preparation for the bicentenary of the Battle of Waterloo in June 2015. A new website dedicated to the “route Napoléon” in Wallonia is also now available, containing maps, directions and information details for your GPS, and even videos of the famous places on the road, narrated by Napoleon himself (!). A time-travelling experience!